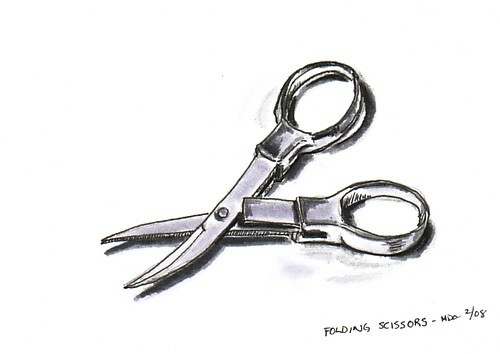 I remember years ago I sat and drew pages of scissors as a sort of negative space exercise. Scissors work really well for training yourself to see the spaces around things. EDM challenge 105 gave me an excuse to sit down with these folding scissors. I think they’re pretty cool. I like the name stamped on them: SAFE-T-SNIP. I rarely use them for anything practical. I just pick them up and fold and unfold them absently and then toss them back on the counter or wherever I happen to find them that day. I am new to EDM and I did the scissors too. I like the shading in your work. Love the scissors. Love all the pencil drawings particularly the lips. BTW your who-am-I link is not working. I am tagging you! I can’t see that you’ve been tagged before, so this is your time. Rules will be on my blog very shortly – when I choose one more person. What a graeat idea – and fantastic drawing! Nice work! I love the lines in your drawings. Thanks for the tag Wendy. I’ll be trotting over there soon to pick up my assignment. u have great talent. i am so happy i stumbled upon your work. i have always wanted to be able to draw, and after seeing ur art and reading the comments, i am greatly motivated. so i bought a sketch book and some pencils to try some drawing. i am 61 years old…. i think that gives me sometime to learn. regards. Brush markers? Well I thought it was line and wash – very skillfully used and some nice shiny metal there. pervaiz, what a sweet thing to say. I’m glad you are motivated to draw. I get so much pleasure from it. Don’t get too frustrate and stick with it. Sarah, I like the wash effect I get with these brush pens. I like using the Tombow double-ended markers. I When I try to do real ink washes I get a horrid mess. I just can’t trust the process and my drawings show it. Using the markers feels a little like cheating, but I like the result. scissors are not easy items to draw Mellanie but you have done a great job with the negative spaces and the modelling… very polished !! Thanks Kim. These were tricky. I’m pleased with how they came out. Previous Previous post: Thanks For Your Support! Next Next post: Yay! I’ve Been Tagged!